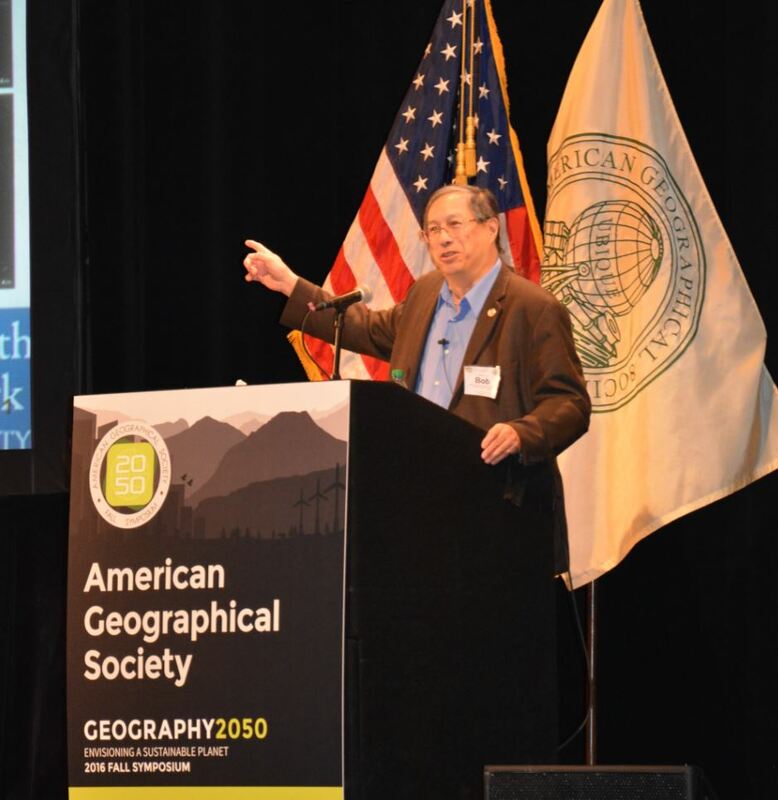 American Geographical Society (AGS) Councilor Dr. Robert “Bob” Chen has influenced and been a part of many different academic and research institutions throughout his impressive career. From Columbia University to AGS, Dr. Chen’s work in the data and sustainability sciences has truly made a positive impact on our world. Bob earned his undergraduate degree in Earth and Planetary Sciences and dual Masters degrees, one in Technology and Policy and the other in Meteorology and Physical Oceanography, all at the Massachusetts Institute of Technology. As a graduate student, he worked at the National Center for Atmospheric Research in Colorado, where he produced his first paper on the potential impacts of sea level rise with climatologist Steven Schneider. He later earned a Ph.D. in Geography from the University of North Carolina at Chapel Hill. He supported several early climate change assessments at the National Research Council, spent time at the International Institute for Applied Systems Analysis (IIASA) in Austria, and worked with recent AGS Charles P. Daly Medal winner Robert Kates on food security issues at Brown University. His work would later combine the fields of geography and data management, leading him to become the director of a large research and data center in 2007, and an AGS Councilor in 2015. For the majority of his career, Bob has worked in the data science and geospatial fields on challenging interdisciplinary research problems such as food security, climate change, disaster risk assessment, and sustainable development. 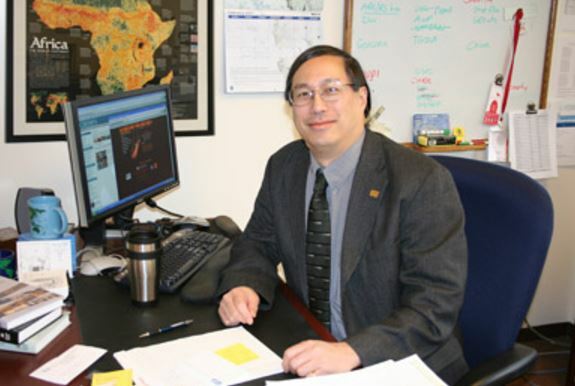 Bob is currently the director of the Center for International Earth Science Information Network (CIESIN), and also manages the NASA Socioeconomic Data and Applications Center (SEDAC). CIESIN is an interdisciplinary research center of the Earth Institute at Columbia University. CIESIN was founded in 1989 as a non-profit organization based in Michigan and relocated to Columbia’s Lamont campus in Palisades, NY in July 1998 under the leadership of former CIESIN director and AGS Honorary Fellow, Roberta Balstad. With more than 45 staff, CIESIN conducts sponsored research on a range of interdisciplinary and applied research problems, supports education and training efforts at Columbia and around the world, and develops and maintains a wide range of data, data services, and decision support tools. SEDAC is one of the distributed active archive centers in NASA’s Earth Observing System Data and Information System. SEDAC focuses on the integration and application of remote sensing and social science data and human-environment interactions across the planet. 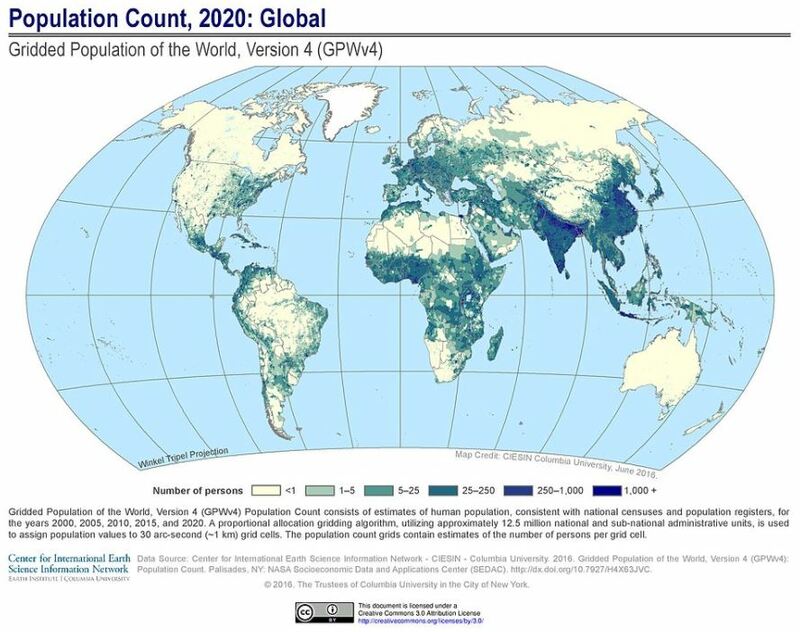 One of Bob’s early projects at SEDAC was to help develop the first global gridded dataset on population distribution by esteemed geographer Waldo Tobler, known as the Gridded Population of the World (GPW) dataset. SEDAC has continued to improve and update this dataset over the past two decades, releasing version 4 late last year. GPW has been extensively cited in the scientific literature and is widely used in research, applications, and education. Bob’s work at CIESIN includes a strong focus on bridging the gap between research and applications. As important as the research and the data associated with it may be, it doesn’t help much if they aren’t used in a smart way to improve the world and people’s lives. Many of Bob’s current projects reflect this view. One standout project involving CIESIN is a partnership with Facebook’s Connectivity Lab, which is working to extend the availability of the internet in rural areas. To do this, Facebook and CIESIN are collaborating to better map population distribution in rural communities in developing countries. This is easier said than done, but Facebook decided to apply its facial recognition techniques…to buildings. This innovative approach, combined with CIESIN’s population data, greatly improves estimates of where people are located in rural areas–a key input in deciding how best to increase their Internet connectivity through cellular networks, satellites, or even high-altitude, solar-powered drones. These data are also very useful for many other applications such as humanitarian assistance, conservation, and development planning. Another innovative project that Bob has had a hand in is the Connected Worlds exhibit at the New York Hall of Science (NYSCI), a science museum located at the site of the 1964 World’s Fair in Queens. Under a grant from the National Science Foundation (NSF), CIESIN worked with NYSCI and Design I/O to create an interactive, immersive exhibit aimed at informal education about sustainability. 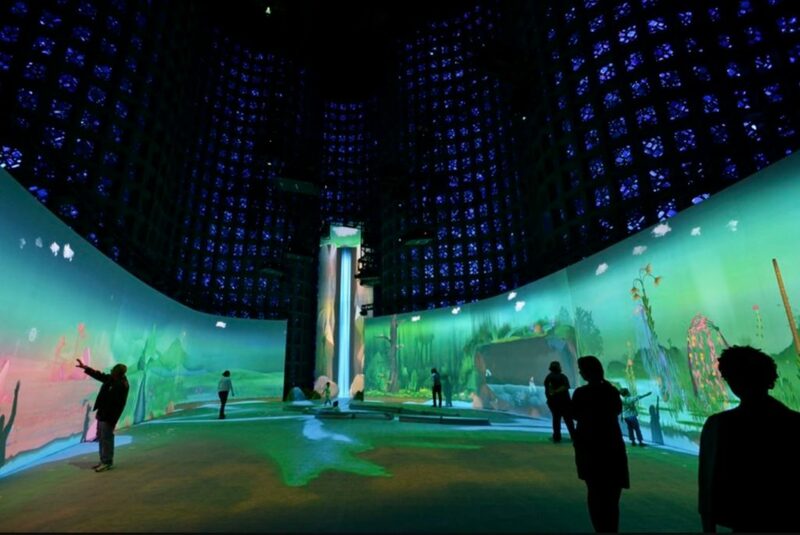 Connected Worlds is a fanciful, virtual reality environment with six different “worlds” or biomes projected onto the walls, connected to one another by a central theme: flowing water. Museum-goers can interact with and manipulate the imaginary flora and fauna in each biome using hand gestures, and alter water flows between biomes using infrared-sensitive logs, to see how their actions directly affect one world but also indirectly affect the others. Connected Worlds has recently won two different prestigious awards given by the U.S. museum and science media communities. A second project funded by NSF is now under way with the same team, aimed at developing a tablet-based game focused on informal learning about computational and ecological concepts. Almost all of Bob’s work is related to geography. Bob states that his work centers on “combining natural, social, and health science data in ways that make sense” to users. To this end, his team at CIESIN utilizes geospatial technologies, including geographic information systems, to create data and tools that are easily accessed and utilized by users. His ultimate goal is to make the wealth of geospatial data available in the world useful to everyday users. “Until you take that spatial data and convert it into a piece of information they are accustomed to… the data hasn’t served its purpose yet,” said Bob. This coincides with how he views his role as an AGS Councilor. Much like AGS itself, Bob has dedicated his career in part to the dissemination and application of geographic information. He strongly believes that the data collected by organizations like NASA and by scientists and research institutions all over the world should be made as openly accessible as possible to support urgent and vital decision making from local to global levels. In 2014, he brought this perspective to an independent expert advisory group appointed by UN Secretary-General Ban Ki-moon, which produced the influential report, A World That Counts: Mobilising the Data Revolution for Sustainable Development. So what’s next for Bob? Quite a lot. Bob anticipates the need for much work on adaptation to rising sea levels—coming full circle to his first paper on this topic published in 1980–and building on recent CIESIN projects to develop decision support tools for Jamaica Bay and the Hudson River Valley. Bob is also very active in the sustainable development data community, contributing to the development of new partnerships and approaches to support the 2030 Agenda for Sustainable Development, which was adopted by the international community in 2015. He co-leads several initiatives on open data sharing, under auspices of international organizations like the Group on Earth Observations and the Research Data Alliance. Through CIESIN’s partnership with East China Normal University in Shanghai, he has helped organize a workshop—featuring AGS President Marie Price and Senior Vice President Alec Murphy—for more than 90 Chinese geography teachers this August in Shanghai. CIESIN will again co-host the Geography 2050 Symposium at Columbia this November, bringing together a diverse set of participants from government, industry, and academia in a range of fields. As an AGS Councilor, Bob strongly believes that those with geographic expertise, resources, and interest in both the public and private sectors need to work together actively and rapidly to develop practical, scalable, and equitable solutions to the many pressing challenges facing the world today and tomorrow.